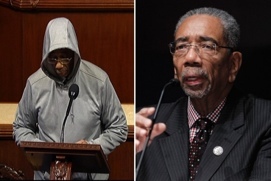 Washington (CNN) — A congressman was removed from the House floor Wednesday after giving a speech about Trayvon Martin while wearing a hoodie. Rush, a former Black Panther who was active in the civil rights movement in the 1960s, then took off his suit jacket, pulled a gray hoodie on over his head and put on sunglasses. “Just because someone wears a hoodie does not make them a hoodlum,” he said. The congressman spoke during the morning session, when members are allowed to address any issue. He applauded young people across the country who are wearing hoodies to make a statement about Martin, the teen who was wearing a hooded sweatshirt when he was killed by a neighborhood watch volunteer in Sanford, Florida. As soon as Rush removed his jacket and put the hood on his head, Rep. Greg Harper, R-Mississippi, who was presiding over the House floor, began to gavel Rush down, saying he was out of order. Rush ignored him, and with the hoodie still pulled over his head, continued to speak, citing the Bible. A floor clerk approached Rush as he finished his remarks and led him away from the podium. “I don’t mind being out of order if it means standing up for truth and justice,” Rush said. The Illinois lawmaker said he understood that those on the floor who ruled him out of order and the staffer who moved him off the floor were doing their jobs, and said he was able to finish his speech. “A lot of it was theatrical, but I wanted the message to go forward,” he said. Rush said he and Rep. Jackie Speier, D-California, were organizing a gathering of House members wearing hoodies on the East Front of the Capitol later this week.